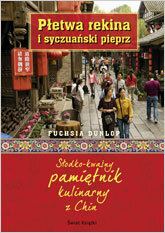 The Polish edition of Shark’s Fin and Sichuan Pepper is now out! Do please tell any Polish friends who you think might be interested! And here is some kind of review of it, which from what I can make out with Google Translate looks pretty good. Another review (viewed through Google translate!) is here – very favourable too! Thanks Pinos, glad you like the books! But I stay with English one. Fuchsia we love your way of writing and your recipes. Do you still consult Bashan restaurant in London? We eat there during our last visit in London. Delicious! Do you know how much tousle we have with facing heaven peppers. We was looking for them one year. But I think we found them in London. Thank you for your books. Fu Xia, I’m almost done reading your book in Polish and I must say that I totally love it. I’ll be featuring it as much as I can on my website and some other places, will keep you posted directly this time. And today, straight from the office I’ll go to a kind of American bookstore in Warsaw and buy the Revolutionary Chinese Cookbook. Just can help it I feel this way I’ll pay my respect to you and the amount of work you’ve put into truly understanding and mastering Chinese cuisine. THANK YOU! All the best. Fuschia: we love this book. We read in every evening ( I read, he listens). Amazing and very funny.